Night Moves is currently playing in limited release in Australia and is distributed by Curious. Subtle on the surface but morally complex, Night Moves is a slow and intense burn. 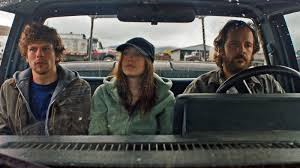 Kelly Reichardt's latest is recognised as an environmentally political film due to it's subject matter along with it's tranquil nature visuals, yet it explores a great deal more than such a film would typically do. The film looks at taking responsibility for and dealing with actions which were made with good intentions, but have outcomes which are less than desirable and lead to human guilt. Night Moves is a very quiet film with big intentions. Wanting to take a political stance for the good of the world, three radical environmental activists hatch a plan of attack on a hydroelectric dam in Portland. Josh (Jesse Eisenberg), Dena (Dakota Fanning) and Harmon (Peter Sarsgaard) find success in their venture which they undertake in order to make a political statement, but none are prepared for the aftermath of their elaborate and dangerous venture. The outcome does not evoke the sense of personal satisfaction or community gratification which they were seeking, but leaves each having to deal with a great deal of guilt, paranoia and the realisation that what seemed like the right thing to do for the environment may not have been worth the inner turmoil they were to endure in the aftermath. Night Moves requires great contemplation and not about the themes typically found in such an environmentally minded film. 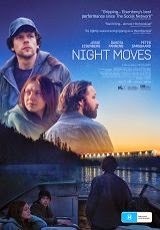 With the exception of the environmental documentary screening in the film at the beginning and some facts about the state of the world during the film, Night Moves gives us very little to contemplate as far as the environment is concerned through plain speech. Yet, it gives us more to contemplate in relation to taking responsibility for your actions even if they were done for the right reasons. In Night Moves, this group believes they are making a stand for the good of the Earth, but they are not the heroes in the aftermath that they were expecting. Each emotionally deals with the guilt of taking responsibility for their actions when they realise they may have gone too far with their ambition. It is a dilemma which is presented in an extremely realistic way through the wonderful screenplay. The film is quietly and subtly suspenseful and as a result very unpredictable. While Night Moves doesn't talk about environmental activism verbally, it more than makes up for this in it's visuals. Even though there is suspense in the character's actions, there is peace in the visuals. The nature shots of the forest and river are extremely tranquil and make the film extremely atmospheric. These beautiful shots install in the viewer a love for these pieces of nature and makes one understand why Josh, Dena and Harmon go to such extremes to try and make people see that this is something worth saving. Something Night Moves also does brilliantly is it avoids showing disaster so the attention is not taken away from the moral implications of the aftermath. The mind is greater than anything the eye can see, so sounds and conversation are used instead to let the viewer see the disasters talked about in their film in their mind rather than on screen. Jesse Eisenberg does well with a character which doesn't show a great deal of emotion or variety until the last minutes of the film. Like the film itself, Josh is a very quiet, contemplative character who makes it known that he is always in deep thought about something. Eisenberg shows his wonderful ability to demonstrate great character development while saying very little. Dakota Fanning's performance is an extremely interesting one. As the rich kid turned enviro-politically minded rebel, Fanning's Dena undergoes change throughout the film due to the change in circumstances. In the beginning, she is calm in their decision to make a difference and even a little cocky feeling as she feels she is thinking the most logically out of the group and is confident in herself and actions. After the event, her emotions get the better of her as she is taken aback by this planning becoming reality and she is then the one who is visibly overcome by guilt. It is an interesting transformation of character and Fanning gives an even and controlled performance to support this development. Kelly Reichardt's Night Moves' originality lies in it's subtle intensity and ability to quietly create a sense of importance. Wonderfully atmospheric and intriguing till the last moment.